Feb 13 - PS 154 Comedy Night! March 7 - Spring Gala! Explore each grade’s project, and enjoy the incredible variations from student to student! Kindergarten explored Kandinsky's flowers. First grade tried collage, with inspiration from Matisse. Second Grade went back in time to learn about ancient Namibian charcoal drawings. Third Graders made self-portraits influenced by the color work of Paul Klee. Fourth grade learned about Hilma af Klimt's work, and made traditional and abstract still life. Fifth grade followed the pencil lines of Picasso by recreating some of his master drawings...upside-down! Thanks everyone for your participation! 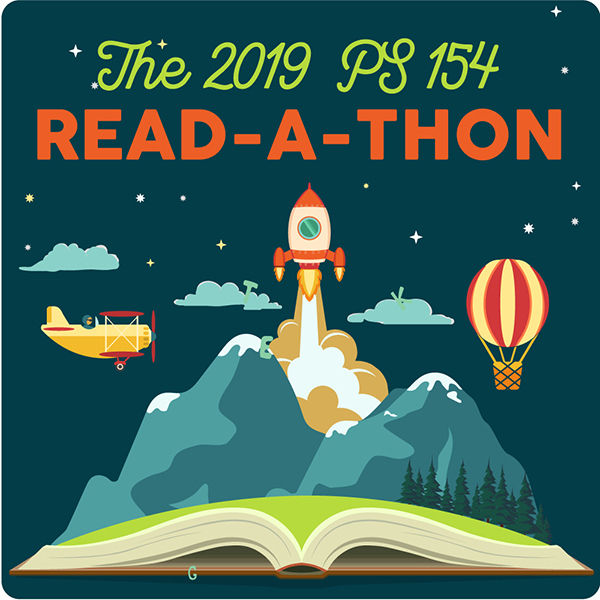 To donate online in honor of a young reader, visit our Read-A-Thon Donation Page! THE SOCIAL & EMOTIONAL LEARNING (SEL) COMMITTEE'S PS 154 PARENTING BOOK CLUB! *Please* join us for the third book club meeting! For this half of the school year, we are doing a deep dive into the work of Dr. Laura Markham, a psychologist, parenting expert, best-selling author and mom who happens to be local to Brooklyn! Her writing and coaching are beautifully aligned with the PS 154 Parent SEL Committee’s goals of parenting through building connection, positive discipline and deepening our children’s and our own emotional intelligence. WHY: to show our commitment to STEAM (Science, Technology, Engineering, Arts and Mathematics) at PS 154! Without PTA funding, our kids wouldn’t have access to Tiny Scientist, the Maker Space featuring Koko, chess, music, sign language and more! Help us ensure that these enrichments continue to be part of our students’ days! HOW: Tickets are available here! A lottery for limited quantity of $20 gala tickets will be available as well. Please reach out to Spring Gala Chair, Jenny Dumlao or Events Chair, Jess Wright if you want to join the Spring Gala team, or with any questions about the event. Box Tops Deadline is Feb 25! BoxTops submission is around the corner! Check participating items for an easy way to have money donated back to our school. Please submit in bags or on a collection sheet to Ms. Guzzi’s office in the MMR. Apply Now for Exciting STEM Enrichment Programs for Spring Break! Kindergarten through grade 12 students can apply now to attend exciting spring break STEM enrichment and experiential learning programs. A wide range of programs are offered at the NYC Department of Education’s Genovesi Environmental Study Center and NYC Center for Aerospace and Applied Mathematics, Intrepid Sea, Air & Space Museum, the Bronx Zoo, Central Park Zoo, Museum of the City of New York, New York Aquarium, New-York Historical Society, Prospect Park Zoo, Queens Botanical Garden, Queens County Farm Museum, Queens Zoo, Staten Island MakerSpace, Staten Island Zoo, and Wave Hill. Student will meet and work with field experts in programs that feature real life, hands-on learning experiences. Explore, tinker, discover, and design with us! Don’t miss out, spots are limited and the application deadline is Friday, February 15. Preference is given to students who attend Title I schools. Download our flyer, learn more, and apply now! For questions, contact Camps@schools.nyc.gov.